If you find yourself facing an unplanned pregnancy and trying to decide if making an adoption plan is right for you, there a few things that you should know to help you make your decision. This is no easy decision, and it will likely be the toughest decision you will ever make. But it has the potential to be a good decision. Arm yourself with knowledge and information to know if choosing adoption is right for you and your baby. Adoption doesn’t have to mean saying goodbye forever to your child. Most adoptions have some level of openness–that is to say the birth parents, adoptive parents, and adoptee have some type and frequency of communication. So what does an open adoption entail? Let’s review the types of adoptions you can have. Closed Adoption: To put it bluntly, this means the adoptive parents and adoptee do not have any contact with the birth parents. But this closed-communication is rare nowadays. A 2012 study found that only 5% of U.S. infant adoptions were closed. Open Adoption: This type has a few more variables to it and often changes in levels of openness, depending on all the parties involved. This can be as open as having a few visits a year to emails, texts, and photos every so often. It depends on your comfort level and the adoptive parents’ level of comfort. However, in most states you will find that a communication agreement is not legally enforceable. When a birth parent signs away her parental rights, the adoptive parents legally get to decide what kind of communication you can have with your child. That’s why it’s important to have discussions with potential adoptive families before you place your child. You need to share your level of comfort with them, and you need ask what kind of relationship is possible with the adoptive parents. This can be an uncomfortable topic to address, but it’s a necessary conversation to have. Many will agree that an open adoption, of some level, is beneficial to the child. Knowing who the birth parents are and being able to communicate with them can answer many questions for your child. Additionally, many birth parents find it comforting to maintain some connection with their child. You can read more about how open adoption is beneficial for adoptees here. When you’re deciding to place your child, it’s important to understand your rights in the adoption process to protect yourself and your child. When you are pregnant and until you place your child with the adoptive family, you control what happens to your child. This means you determine any medical decisions your child may need made. You are your child’s legal parent. After you sign over your parental rights to the adoptive parents, you are no longer the legal parent of your child. You also are in complete control of choosing which family to place your child with. That is your decision alone. That might seem a little intimidating, so be sure to check out the next section on how to choose a family for your child. Remember, it is only your right and choice to choose adoption for you and your baby. No one else gets to make the decision for you. You should also look into your rights as a birth parent in your state’s laws. You can choose the state you live in and check under the section titled “Consent to Adoption” to find out any specifications your state has. You get to decide if you would like to place your child privately or using an agency. There are pros and cons to both, so there is no wrong answer. And both options should come at no cost to you. When you chose to place your child privately, or through direct placement, you will be alone in the decision to place your child, finding the family for your child, and after placement. Most adoption lawyers do not offer extra services for the birth parents before or after an adoption. An adoption lawyer will not be any cost to you; the adoptive parents are in charge of the finances. Additionally, depending on your state’s laws, an adoption attorney can help assist adoptive parents in paying for some pregnancy fees that you have. It is important that you find an adoption attorney that is experienced and mindful of your rights as a birth parent. A good adoption attorney should be able to answer any questions you have about adoption. It’s important to note that in five states direct placement is not permitted: Colorado, Connecticut, Delaware, Massachusetts, and North Dakota. If you choose an agency to assist you in your adoption journey, be sure to find a reputable agency that respects you, your rights, and all birth parents. A good agency will not force you into an adoption, but will help you find the best option for you and your child, whether that is placing your child for adoption or parenting your child. Nearly all agencies offer counseling before and after placement. A good agency should have counselors and social workers that can answer any question you have, help you decide which choice you make, and be skilled in helping birth parents manage grief. Agencies also have connections to help you if you decide to parent. If you choose to place your child, then agencies will often have family profiles for you to view, which can help you choose the family you want for your child. It is up to you how you would like to have your adoption journey go. Weigh the pros and the cons between direct placement and agency. You can also visit the Pregnant And Considering Adoption community group to ask questions and see what other expectant parents have chosen and why. You can also talk to birth moms that have placed here for more advice on your choice between agency and direct placement. Once you have made the decision to place your child for adoption, you may wonder what the rest of the process will look like for you. First, it will be up to you to choose between an agency or adoption attorney. The adoption professional will be able to help guide you through the adoption process. You can read the section above or this to learn more about choosing an adoption professional. You can also get help choosing a professional here. Next, you will need to determine what kind of relationship you want with your child. Although placement means you will surrender your parental rights, you will have the task of choosing your child’s adoptive family, which means you want to choose a family that would like the same level of openness in the adoption relationship. Once you’ve decided what kind of relationship you would like, it’s time to choose which family you would like to place your child with. This can be a daunting task, but your agency may be able to assist you. You can also view families looking to adopt online at sites like Adoption.com Parent Profiles. It may help to make a list of the qualities you’re looking for in a potential family and match those qualities to the profiles you view. You will also want to begin meeting with a professional to prepare you for the grief that will come after placement. Your agency may provide this service, so be sure to ask. Additionally, it’s important to watch out for postpartum depression and get the help you may need. At the birth of your child, you decide who can be in the hospital with you and how much time you would like to spend with your child after his or her birth. After the birth of your child, the finalization process and the signing away of your parental rights will be the next steps. After you sign your rights over to the adoptive parents, there may be a brief period you can change your mind about placement, usually just a few days, but you can see what your state’s laws are here. After placement, it is important that you continue to seek postpartum care. You will be healing in more ways than one, so take care of yourself and seek any counseling or medical attention that you may need. The rights of birth fathers vary greatly from state to state, so it’s important you check the laws for your state. Even the definition of a Father varies from state to state. Your adoption professional will also be able to guide you through your options considering the birth father rights. Much of what rights a birth father has will also be determined by the relationship between the two of you. Check your state’s laws on the rights of unmarried fathers. Considering Domestic Adoption? What You Need to Know About Birth Father Rights. Regardless of whether you choose to parent or place your child for adoption, it is important that you receive the prenatal care you need to ensure the health of your baby and you. You and your child’s health and wellness will be determined by your diet, regular visits to the doctor, and your lifestyle choices. If you choose an agency, your social worker or counselor should also be able to point you in the right direction for resources in your area. You can also click here to find support near you. Choosing a family can be an exciting and terrifying experience in your adoption journey. Starting out, remember it’s not your job to provide any of the couples with a child. Your “job” is to choose the family that you feel will be the best family for your child. You can start this a few different ways. Before you start looking at families, it’s important to decide what kind of qualities you want your child’s parents to have. You might consider making a list of these qualities. This is also where you should make note of what kind of relationship you want with your child and their adoptive family–that way you can make sure you find a family with a similar desire. If you’re working with an agency, they likely have waiting families, people who are hoping to adopt. You can view their profiles, learn more about them, and even meet and talk with them. Once you’ve narrowed your search, you can start contacting the families or have the agency contact them if you would rather. Make sure you make a list of questions you would like to ask to get to know the families better. And remember that you don’t have to choose any family that you decide to meet with. Take your time deciding. Don’t rush the decision. You can also rely on your gut to help you decide. 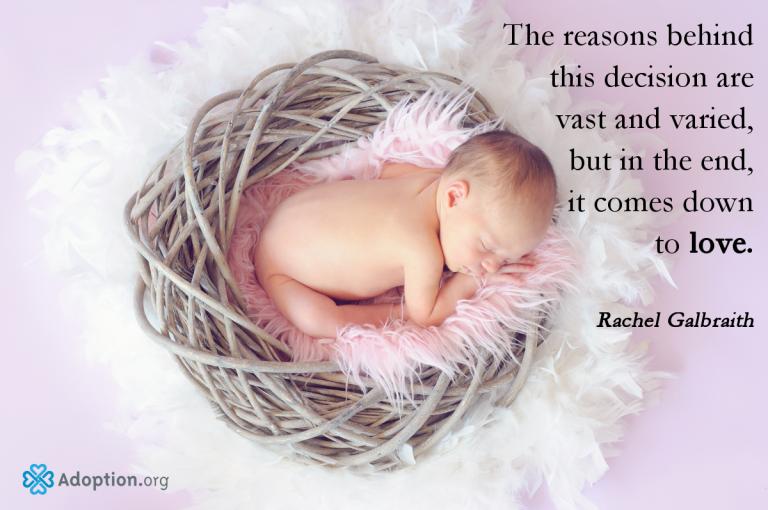 You have a mother’s intuition before the baby is born. Of course, some families may have red flags for you, but there is the right family out there for your child. Families that agree too quickly, appear secretive, and are vague may not be the right family to build an open adoption with. Relinquishment in terms of adoption means that a birth parent is voluntarily terminating his or her parental rights to his or her child so that the child may be adopted. There are involuntary termination of parental rights, but for the purposes of a pregnant woman considering adoption, those do not apply. In most states, relinquishment can only happen after the child has been born. Most states have a period where the birth parent can revoke the relinquishment and that can range from a few days to several months. There are several states where relinquishment cannot be revoked after the papers have been signed. Your adoption professional can explain the laws that will be specific to your state or you can find out here. The time of relinquishment may be as early as the day of birth in the hospital or in courtroom a few days later. It depends on how you would like to proceed and the laws in your state. You may consider bringing in a loved one to comfort you. Some birth mothers have even brought in a gift to give to their child to take home with their adoptive family. One of the best things you can do to help you make this decision is to talk with birth parents and even other women facing an unplanned pregnancy. Sometimes getting a little perspective can help clear your head and help you make the right decision for you. You adoption professional may be able to help you find a local group of women to meet and talk with. If a local meet-up isn’t possible for you, you should consider reaching out on forums and groups. There are many that have gone before you. You are not alone in facing this and you are not the first to face this. Be comforted that there are others on a similar journey and rely on each other for support. You will feel so many things as you go through this journey, so having someone, a friend or family member, to talk with will make all the difference. You may wish to reach out on one of the above communities, anonymously or not, to talk about your options. Do not be afraid of opening up. There are safe places for you to ask freely and get help. You may also wish to watch this video about women that choose to place their babies. Here is a Q&A session with another birth mother. You may also want to hear from these women who were facing an unplanned pregnancy. You can also read these real stories from real birth mothers. To discover more adoption discussions and adoption forums, visit adoption.com/forums. This is completely your choice. Until you terminate your parental rights, your baby is yours. At any point up to the finalization, you can change your mind. You should feel confident about your decision. Adoption is a permanent decision for you and your child. If you choose to parent, your adoption professional should still help you to find necessary resources to raise your child should you need assistance. You may also wish to speak with other birth parents and the reasons they choose to make an adoption plan. Listen to birth mothers here. There are also groups and forums you can join to discuss your adoption plan with other women that are going through the same thing as you. You can also reach out to an adoption professional for support and counseling here. You can read more about choosing adoption for your baby in this guide.